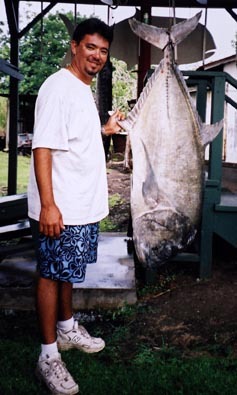 Robert was fishing on the Ka'u Coast of the Big Island when he hooked his 114-lb giant trevally. His 12-foot 9-inch Outcast Maxum pole, Newell 626-42 reel and 80-lb test Maxima line passed the test and defeated the big boy after a substantial battle. Robert weighed his fish on the Hilo Casting Club's scale--a scale that's seen a lot of 100-plus-lb fish.